Barrisford Petersen is the Managing Director of BBP Law and holds a BA and LLB degree from the University of the Western Cape and has studied extensively in the United Kingdom and USA. 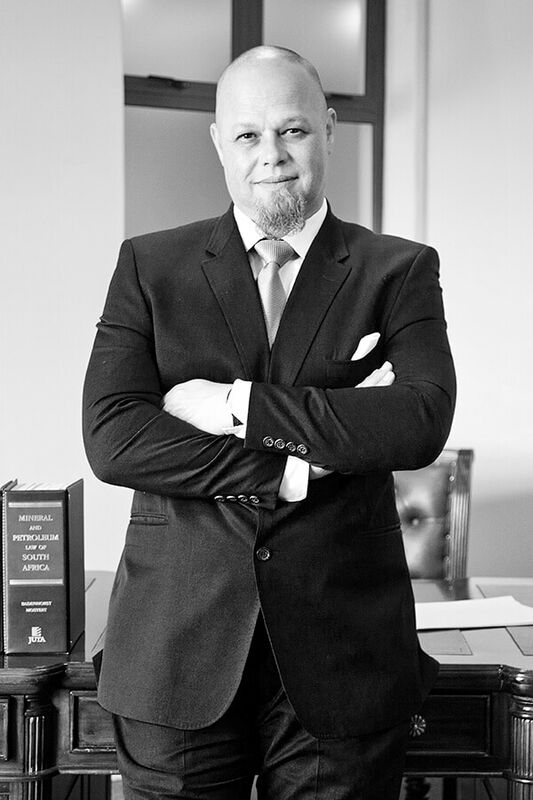 Barrisford established the first Cape Town based legal practice specializing in the energy sector and is an international oil and gas law specialist with more than 23 years’ experience in the industry and he is the founder of BBP Law. Barrisford previously worked as manager of legal services for the South African national oil company now known as the PetroSA. He then entered the private sector and practiced as an advocate of the High Court of South Africa and managed his own private legal practice which focused exclusively on African oil and gas activities. In 2009 he joined a leading corporate and commercial law firm in South Africa where he was appointed as the head of the oil and gas division. Barrisford has extensive experience in the international oil and gas industry, having worked closely with a number of local and international oil and gas companies doing business in many African countries including: Egypt, Libya, Algeria, Equatorial Guinea, Mozambique, Botswana, Tanzania, Gabon, Congo, Yemen, Nigeria, Somalia, Angola, Namibia, Mauritania and Chad. He has advised clients on bidding rounds, host government contracts and has been involved in drafting and negotiating of oil and gas related agreements for some of the most complex oil and gas projects. Barrisford recently presented a Master Class course on Africa’s Oil and Gas Contract to industry specialists in South Africa and Ghana and he is the co-author of UK publication “Getting the Deal Through-Oil Regulation 2011”. He is also part of the team awarded the 2014 Legal Advisor of the Year Award by African Investor. Barrisford brings to BBP Law not only his accumulated experience but also a network of relationships essential for doing business in Africa. Barrisford has extensive experience in the international oil and gas industry, having worked closely with a number of local and international oil and gas companies doing business in many African countries. Barrisford brings to the firm not only his accumulated experience but also his network of relationships essential for doing business in Africa. He has advised clients on bidding rounds, host government contracts and has been involved in drafting and negotiating of oil and gas related agreements for some of the most complex oil and gas projects. Barrisford has actively been involved in the drafting and negotiation of all forms of agreements which including, but not limited to merger and acquisition agreements, farm-in and farm-out, joint venture, joint bidding and participation agreements, asset and share acquisition agreements, onshore and offshore construction project agreements, FSO and FPSO agreements, logistical services agreements. Advising UK based IOC’s, Impact Africa and its parent company Impact Oil and Gas on its Tugela South exploration right, the scope of work including drafting of Deeds of Assignment, Renewal Application, Deed of Renewal as well as advising on various reporting obligations and regulatory requirements from time to time. He advised on its farm-out to ExxonMobil in a joint mandate with Bracewell & Giuliani LLP, the scope of advice covering the review of relevant agreements and advising on regulatory compliance to give effect to assignment, reviewing and negotiating final terms and conditions of host government instruments with the Petroleum Agency of South Africa on behalf of Impact Africa in respect of its technical co-operation permit in the Transkei / Algoa basin offshore South Africa. Advised ASX listed IOC, Kinetiko Energy Ltd, on coal-bed methane technical co-operation permits and exploration rights in South Africa, the scope of work including drafting the Permit and Right Applications as well as the subsequent Conversion Applications, Renewal Applications and Transfer Applications of the exploration rights. Advised on Technical Co-Operation Permit and Exploration Right Applications for shale gas in the Karoo Basin, the scope of work including drafting of the applications and subsequently advising on the effects of Ministerial moratorium. Due Diligence Report confirming title and current standing of petroleum exploration licence offshore Namibia prepared for AIM listed IOC, Tower Resources, in preparation for its intended fundraising of approximately £19.3 million in a joint mandate with Watson Farley & Williams. Advised on the sale of a participating interest to major IOC and AIM listed IOC in respect of Walvis Basin offshore blocks, scope of work including drafting and negotiating terms of Farm-Out Agreement, Escrow Agreement, Deeds of Assignment to Petroleum Agreement and JOA, Deed of Amendment to JOA, obtaining Ministerial consents and approvals, filing merger notices and obtaining Competition Commission approvals and drafting Completion Agreement. Lead legal advisor to UK based and SA based IOC’s on submissions to Ministry of Mines and Energy of Namibia for amendments to, extensions and renewals of Petroleum Agreement terms and conditions and WP&B obligations as well as the applications for and transfers of Petroleum Exploration Licenses. Advised on the transfer of five petroleum exploration licenses held offshore the Falkland Islands, scope of work including the preparation of all Assignment Agreements and Performance Guarantees for approval by the Falkland Islands Government, as well as joint venture partners. Advised on a consortium proposal for a joint bid submission for the UK 14th Landward Oil and Gas Licensing Round administered by the Department of Energy and Climate Change (DECC). Advised on the transfer of a participating interest in a gas exploration project in Tanzania. Advised on an expression of interest for petroleum concessions for the exploration, development and production of petroleum in respect of various offshore blocks in Gambia. Advised on coal bed methane exploration licences in Botswana. Advised a BVI IOC and its wholly owned Sierra Leone subsidiary on the 3rd offshore licensing round for hydrocarbon exploration and production in Sierra Leone. Advised on the bid round procedures, requirements, and form of bid submission. Advised on the transfer of various exploration blocks in Kenya. Advised an Australian based IOC on an oil and gas exploration project in Kenya. Legal advisor to AIM listed IOC, in a joint mandate with Corpus Legal, on its acquisition of two petroleum licences in Zambia. Advising foreign IOC’s holding petroleum exploration assets in Africa on Mauritius GBC structures. Legal advisor to consortium on a Joint Venture Bidding Agreement for the Iraqi second bidding round, scope of work including drafting the terms and conditions of the JV bid agreement. Advised a major IOC on applications for and acquisitions of offshore exploration rights in terms of South African law, scope of advice covering compliance with the Mineral and Petroleum Resources Development Act, Companies Act, the implications of Schedule 10 of the ITA, the Mineral and Petroleum Resources Royalty Act, the Royalty Administration Act, Transfer Duty Act, Value Added Tax Act, Exchange Control Regulations, Competition Act and providing advisory opinions on stability agreements and DTA’s. Advised a US based IOC on rollover treatment afforded to Oil and Gas companies in terms of the ITA of South Africa, Reserve Bank procedures and repatriation of funds in relation to a sale of shares transaction. Advised on 2D Marine Seismic Acquisition Agreements for the Bremer Basin offshore Western Australia. Advised on the acquisition, processing and interpretation of approximately 274,160 line kilometres of airborne magnetic data on a multi-client basis. Advised on and negotiated the terms and conditions of a Services Agreement for a semi-sub MODU. Advised on funding proposals for production and infrastructure development costs, scope of work including reviewing and negotiating engagements for marketing and structuring of mezzanine tranche funding and private equity funding and advising on government support packages and government guarantees. Advised on procurement processes for Drilling (turnkey) services, trees and controls, Offshore Survey and Logistic Services. Africa Investor (Ai) Infrastructure Awards part of the team awarded the 2010 Oil and Gas Deal of the Year. Africa Investor (Ai) Infrastructure Investment Awards part of the team awarded the 2014 Legal Advisor of Year Award. Featured Cover and Article – Oil & Gas Decisions Magazine 2016. Recognised by Global Law Experts as South Africa’s Legal Advisor in the Oil & Gas Industry.